three more years to reverse her gains in the last 6 months. Much blood and many tears would flow, but they would go no further. Admiral Nagumo’s carrier force (Akagi, Kaga, Hiryu and Soryu) left port for Midway. Escorting the force were two battleships, three cruisers and a swarm of destroyers. The victors of Pearl Harbor, the scourge of the South Pacific and Indian Ocean, headed to destiny. 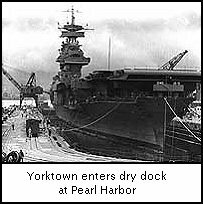 The US carrier Yorktown, still showing the scares of battle from the Coral Sea battle, enters Pearl Harbor’s dry-dock to undergo emergency repairs. Task Force 16 sets sail for Midway Island to meet the Japanese invasion force. The force of two carriers (Enterprise and Hornet), six cruisers and nine destroyers set sail to do battle with nearly 90 Japanese warships. The slow battleships were intentionally left behind and ordered to protect America’s west coast. Nimitz had fully grasped the concepts of modern speed over firepower and the supremacy of airpower in naval action, something his counterpart Yamato was yet to learn. On the other side of the Pacific, the Japanese Midway attack force sets sail. Included in the massive armada is the new battleship Yamato. This ship, the most powerful battleship in the world, carried 18” guns. The fleet includes two other 16” battleships and a swarm of cruisers and destroyers, as well as troop transports and support ships. In an amazing feat of dockyard efficiency and perseverance, Yorktown, still showing the scares of battle and showing the signs of hasty repair left Pearl Harbor to join the fleet at Midway Island. Task force 17 consisted of Yorktown, 2 cruisers and 5 destroyers. 0900 PBY "Catalina" flying boats made contact with the Japanese support group 700 miles west of Midway. 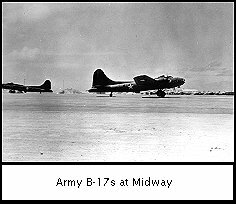 1520 Nine B-17s from Midway made a high level bombing attack against the support group, now 570 miles from Midway. 0130 Four Catalina's flying boats attack the Japanese support force - they missed. carrier borne as well as surface ship based sea planes to provide the coverage. The Japanese also launch their Midway strike (36 Vals, 36 Kates, 36 Zeroes). 0445 The Midway strike flight finishes launching and heads for the island while Nagumo brings his Kate torpedo bombers on deck prepared for a launch against the American carriers if spotted. 0500 The seaplane scout from the Japanese cruiser Tone was delayed in launch due to a faulty catapult but was launched only a half hour late. 0520 Catalina's spot Nagumo's carriers. The Japanese Zero fighters pursue the Americans and begin a game of "cat and mouse" among the clouds above the Japanese fleet. 0545 Catalina scout plane makes its first brief report on spotting the enemy fleet but details were not yet available. 0555 Midway radar reports that it has identified the incoming enemy air raid and scrambles all planes still on the island. 0600 All planes on Midway Island have taken off, some stay to provide fighter protection while others proceed to the recently spotted Japanese ships. 0605 A detailed report from the Catalina scout plane is sent. Yorktown's carrier based scout planes are recalled. Enterprise and Hornet steer for the enemy fleet and prepare to launch an all out strike at maximum range. 0615 Twenty antiquated F2F Brewster Buffalos and six modern F4F Wildcat Marine fighters meet the Japanese air raid heading for Midway. The short melee ended with the downing of several of the Japanese bombers, and heavy losses to the Marine fighters (17 shot down and 7 badly damaged). 0635 The Japanese raid over Midway begins. 0700 The Japanese raid over Midway is completed and the flight commander, Lt. Tomonaga, reports that a follow-up raid is needed to finish off the island's defenses. 0705 US aircraft from Enterprise and Hornet are ordered to make an all out strike at the Japanese carriers. The raid consists of 29 torpedo bombers, 67 dive bombers and 20 escorting fighters. It would take an hour to launch and assemble the groups for the raid. 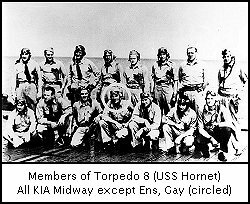 0710 Four B-26's armed with torpedoes and ten Marine torpedo bombers from Midway made contact with the Japanese carrier force and attacked. Japanese fighters intercepted the Americans and shot most of them down before they could launch their weapons. None of the attacks succeeded in hitting a target. 0715 Nagumo, having just seen an attack on his group from Midway and not yet having any contact reports from his scout planes, decides to take the Kate torpedo bombers below deck to the hangars and have them rearmed with high-explosive bombs for a follow-up attack on Midway. 0730 The Japanese scout plane from 'Tone' (the one which was delayed by 30 minutes) reports that it has spotted an enemy formation of 10 ships but neglects to provide information regarding composition (carriers in particular). Nagumo suspends the rearmament of the Kate's until clarification of the spotting report can be made. 0750 Concerned about lack of fuel, Enterprise orders her dive bombers to proceed to the target and the other flights would proceed when assembled. Contact between the various groups was lost almost immediately. 0755 Sixteen Marine dive bombers from Midway attack Nagumo's carriers. All available fighters are sent aloft to confront the new threat. 0810 The Japanese scout plane from 'Tone' reports that it has spotted an enemy formation of 5 cruisers and 5 destroyers. Relieved that there were no carriers in the force, but the report is short lived as a new American attack is reported to be heading in. 0815 Fifteen B-17's, flying at 20,000 feet make a high altitude bombing run at Nagumo's carriers, no hits are achieved. 0820 The Tone's scout plane reports that it has spotted an American carrier with the group previously spotted. 0820 Eleven Marine bomb armed scout planes from Midway attack Nagumo's carriers. 0825 The US submarine Nautilus launches torpedoes at one of the battleships escorting Nagumo's force but the Japanese are able to dodge the pathetically slow American torpedoes. 0835 The Midway strike force, low on fuel and with some seriously damaged aircraft, makes contact with the Japanese carrier force and requests immediate landing. Nagumo orders his bombers rearmed with torpedoes and armor-piercing bombs for a strike on the US carriers. 0840 The American strike groups begin to arrive in the area that they assumed the Japanese carriers would be only to find empty seas. Unknown to the strike leaders, Nagumo had changed course to the Northeast to close with Yorktown. Hornet's dive bombers headed Southeast (toward Midway) into empty sea. The two torpedo bomber groups spotted smoke on the northern horizon and headed for that. Enterprise's dive bombers headed Northwest (back along the expected path of the Japanese carriers). The strike was now completely uncoordinated. 0920 The Japanese, their strike aircraft rearmed, on deck begin fueling and preparations for takeoff, receive report that an American raid is coming in. 0925 Hornet's torpedo bombers head into the attack. They were not protected by fighters and in order to deliver their weapons, they had to fly low and slow. The patrolling Japanese fighters pounced on the easy targets and one-by-one, each of the American planes was shot down. Only one man, Ensign George H. Gray survived the onslaught. Through the remainder of the day, he would cling desperately to a seat cushion not daring to inflate his raft for fear that it would be spotted by the Japanese fleet which surrounded him. 0940 The Enterprise's torpedo bombers attack the Japanese carriers. The defending Zeroes and anti-aircraft fire wrecked havoc among the attacking aircraft. 0945 Enterprise's dive bombers sight a Japanese destroyer (which had been tasked to drive off the Nautilus and was now returning to the carrier group). The group commander decided to follow the ship's heading and soon after spotted the Japanese carriers. 1000 The Yorktown's torpedo bombers attack the Japanese carriers. The defending Zeroes and anti-aircraft fire wrecked havoc among the attacking aircraft. 1020 The last group of American attack aircraft, a combination of Yorktown and Enterprise dive-bombers, arrived independently over the Japanese carriers. The Japanese fighter protection had been spent destroying the previous waves of attackers and the carriers stood defenseless against the American raiders. The Japanese decks were at their most vulnerable, still crammed with fully armed and fueled strike aircraft. All Admiral Nagumo could do was watch the destruction of his once proud fleet. Akagi, Nagumo's flagship, was struck amidships. The bomb penetrated the deck and detonated torpedoes in the hanger. This destroyed the flight deck and started numerous fires. A second bomb hit among the planes on deck starting a massive fire that engulfed the ship. Akagi was doomed. Nagumo transferred his flag from the stricken ship minutes later to the cruiser Nagara. Kaga received four bomb hits. One blew up a fuel truck on deck which threw burning gas over the island, incinerating everyone on the bridge. The other three bombs hit the packed aircraft and the entire flight deck was ablaze. The inferno was out of control in minutes. Yorktown's bombers hit Soru, striking with three bombs. One bomb penetrated to the hanger deck and caused massive damage while the others hit among the planes on deck starting fires which spread throughout the ship in minutes. In the span of 5 minutes, the Japanese carrier strike fleet, the dreams of victory and empire were engulfed in flame and destruction. 1100 Yorktown launches scout planes to search west for the survivors of the Japanese "carrier" group. Meanwhile Hiryu launches her surviving torpedo planes and half her escorts for a raid on the American carriers. 1150 The American strike force lands back at their carriers and reports that one Japanese carrier (Hiryu) survived. 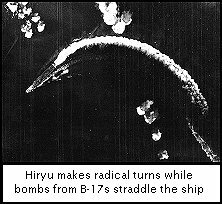 1155 Hiryu launches her torpedo planes and the last of her fighters to attack the American carriers. 1200 Yorktown radar picks up an incoming raid. The raid consisted of 18 Val dive bombers escorted by Zeroes. Yorktown's fighters hit the attackers, killing 10 of the bombers. Two more fell to anti-aircraft. However, the remaining Japanese airmen, showing the skill and bravery that had brought them this far delivered their bombs with devastating effect. One bomb hit the flight deck, tearing a huge hole in the wooden deck. A second bomb, hit the funnel. A third bomb penetrated four decks and blew up deep in the bowels of the ship. Fires started which threatened the ships magazine and fuel bunkers. The funnel hit extinguished the engines and speed dropped as the boilers lost draft. 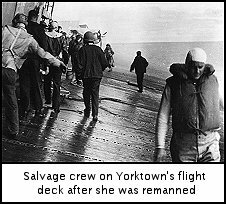 1235 Yorktown's flight deck is repaired, but her engines come to a stop and she is dead in the water. Enterprise begins landing Yorktown aircraft as Japanese raid has disabled her. 1325 Yorktown repairs her plant and begins refiring her boilers. She is able to make 20 knots. 1350 Yorktown's fires, save for the fire below deck, are under control and flight operations recommence. 1400 Yorktown's radar reports another incoming raid. Fighters intercepted the Japanese torpedo planes and shot several down. 1430 Yorktown scout planes spot the survivors of the Japanese "carrier" force. 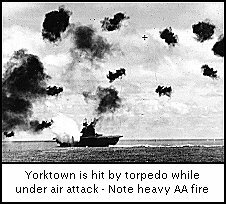 1445 Japanese torpedo planes, under intense anti-aircraft fire, drive home their attacks on Yorktown. Two torpedoes struck Yorktown. All steam and electrical power was lost, the rudder was jammed, and the ship was again dead in the water. The ship quickly flooded and took on a 26-degree list. Counter-flooding was impossible with no power for the pumps and the ship was in danger of capsizing. The order went out to abandon ship. 1530 Enterprise commences launch of a strike force of 24 dive bombers. 1605 Hornet launches a strike force of 16 dive bombers. 1640 Kaga, fires still burning out of control, was ordered abandoned. 1705 Enterprise strike force hits Japanese carrier Hiryu and battleship. Hiryu is pummeled with bombs and is burning out of control as the American bombers depart. 1715 After fighting fires for seven hours, Akagi was finally abandoned. 1730 Hornet dive bombers attack Japanese force hitting a battleship and heavy cruiser. The carrier Hiryu is ignored as it was completely engulfed in fire. 1810 Twelve B-17s from Oahu made a low level attack on the Japanese "carrier" group. 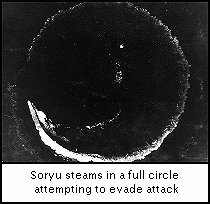 1913 Fires still burning throughout the ship, Soryu slips beneath the waves. 1920 The last of Enterprise's and Hornet's combat air patrols lands as night falls. 1925 Two massive explosions ripped through Kaga, tearing her apart. The wreck sank within minutes. 0230 The burned out hulk of the Hiryu finally sinks. 0700 Twelve Marine dive-bombers launched from Midway targeting Japanese cruisers. 1320 Seven B-17s set out to attack the remnants of the strike group, contacting a single cruiser 300 miles NW Midway, which it attacked. 1435 Viero takes Yorktown in tow, making 2 knots. 1500 Enterprise launches 32 dive bombers intended for the now carrier-less carrier group..
1510 Hornet launches strike force of 26 dive bombers, also targeting the "carrier" group..
1545 Five B-17s set out to attack the remnants of the strike group, contacting a single cruiser 425 miles NW Midway, which it attacked. 1830 Enterprise and Hornet groups make contact with an enemy cruiser and attack it. 2000 Enterprise and Hornet recover their strike groups. 0510 TF16 launches scouts operates west semi-circle to 200 miles. 0645 Scouts contacted cruisers Mikuma and Mogami with 3-4 destroyers 435 miles west of Midway. 0755 Hornet launches a strike force of 26 dive bombers. 0950 Hornet strike force attacks a group of Japanese cruisers and destroyers. 1045 Enterprise launches 34 strike aircraft at the enemy cruiser force. 1150 The Enterprise strike group attacks Mogami and Mikuma, sinking the later. 1200 A salvage crew boards Yorktown as destroyer Hammann is secured alongside to assist. 1335 The Japanese submarine I-168, sent by Yamamoto to track down the crippled Yorktown, found her target and launched four torpedoes. One torpedo missed, One hit the Hammann, sinking her almost immediately and the two others struck Yorktown. Shortly after Hammann had sunk, her depth charges exploded causing more damage to Yorktown. The list was reduced to 17 degrees but shock damage was extensive. The salvage crew was removed and would be put back on board the next morning after contact was made with a fleet salvage tug. 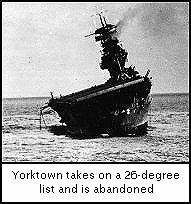 However, at 0330 the next morning, Yorktown started to listing to port again. By 0500, she turned over on her side and sank. The Battle of Midway was over. In this day and age, it is difficult to imagine the difficulties faced in the intelligence services of World War II in gathering and collecting information on the enemy. extensive capabilities to intercept, decode and interpret messages. This is the essence of modern "communications intelligence" and it had it's birth at Midway. be decisive if acted upon in a timely manner. COMINT consists of two distinct phases - interception/decoding and interpretation. Communications is one of the most important aspects of military science. than the local Japanese commanders. showed the importance of the second phase - interpretation. were about to commence a major offensive operation. It called for the occupation of Port Moresby, Tulagi and a place called "RY" which was as yet undetermined. although the battle was a draw tactically, the Americans had stopped a major Japanese threat and achieved a strategic victory. that another major attack was in the works for late May or early June. An intercept on May 6 indicated that all the Japanese fleet carriers were preparing for action. if he were to have any force to counter this major Japanese offensive, he would have to know where to send his carriers in short order. During the next week, OP20G received additional information on the Japanese order of battle, including large contingents of landing and occupation forces. was for islands in the Hawaiian chain but that could include anything from Oahu to Midway. down and there was a serious shortage of fresh water on Midway. The Japanese dutifully sent their message to their forces that "AR is short of water". to be ambushed, all thanks to COMINT, the unsung hero of Midway. telling the truth about a war. Either they report the myth, or they throw in some ridiculous love story, or they simply spew propaganda. Sometimes they manage to do all three. dreams up. Das Boot, The Longest Day, Dawn Patrol, VTora Tora Tora and Zulu are some of the best. Midway is a good film and I'd recommend it to anyone interested in the battle - or simply a good war movie.